A critically acclaimed play that addresses bullying, identity, sexual orientation and education. Directed by Paula Paz, associate director of the Cervantes Theatre, and starring Rachel Sanders and Paul Albertson. 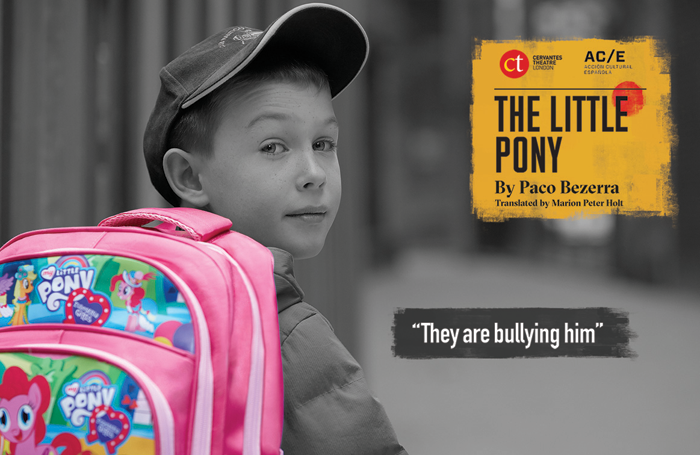 The Little Pony is at Cervantes Theatre, London until June 30. To win a pair of tickets to see The Little Pony at Cervantes Theatre, go to thestage.co.uk/competitions and enter your details and put PONY in the code box. Entries close at midnight on June 26. Terms and conditions: A pair of tickets valid for performances on June 29 and 30. Subject to availability. Travel not included. Non transferable. No cash alternative. By entering the competition you agree to your contact details being passed securely to a third party who will only use them for the purpose of this competition and to your name being published in The Stage newspaper.